Shah Rukh Khan or King Khan as he is fondly called recently hosted a Diwali party at his mansion Mannat. The whos and whos of B-Town were present adding more sparkle to the the already glamorous party. I spy with my little eye the best of couture I came across at the diwali party. Scroll down to see who wore what! The hosts of the party were all decked up in the royal shades of black and blue. How adorable does AbRam look?! 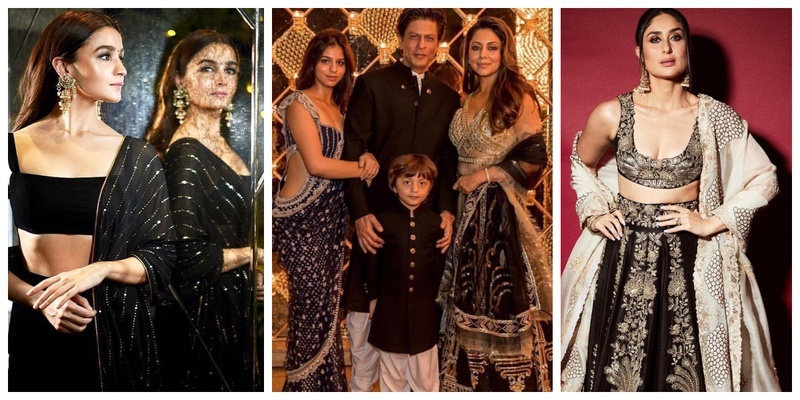 Everyone’s favourite Bhatt, Alia wore an all black lehenga and accessorised it with some light jewellery. Classy and elegant! If Shilpa Shetty doesn’t keep up with the current fashion, is she even Shilpa Shetty? She wore gharera pants (the new rage!) and contrasted well with her husband Raj Kundra. Bebo looked stunning in a bespoke Anamika Khanna lehenga! Adorned in a dusty pink dress, Kajol looked her pretty self! The nation’s heartthrob Katrina Kaif wore a black saree and looked sexiest! Love love love Sonakshi Sinha’s white lehenga. Her attire is total bridesmaids goals! Kriti Sanon’s lime yellow lehenga is one of the prettiest one we’ve seen in this colour! A strapless blouse and sheer saree? Yes! Kiara advani looked like a million bucks! Black seemed to be the colour of the evening as even Shraddha Kapoor chose a black lehenga for the party! Saif Ali Khan’s daughter Sara Ali Khan looks beautiful in this golden lehenga!